Setting aside any potential health risks associated with indoor mold growth, the ability mold has to cause significant damage to your property is indisputable. However, the effects of mold on construction materials can be reduced, and even prevented completely, by controlling the cause of every mold issue – moisture. 1. 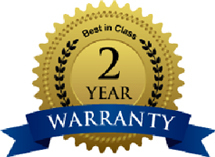 Direct water intrusion event such as a roof leak, plumbing leak, poorly sealed leaking windows, drain back-ups, water run-off from showers and bath tubs, etc. 2. 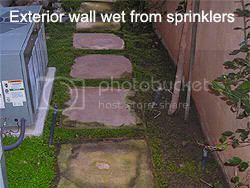 Indirect water intrusion from "rising damp" such as moisture wicking up from the ground or damp concrete slabs into walls, carpet, cabinets, furniture, etc. 3. Intermittent water intrusion from condensation caused by humidifiers, vaporizers, high steam, inadequate ventilation, faulty windows, and high humidity. The obvious effect of mold growth inside buildings is the damage it causes to construction materials and personal property. The nature of mold is to decompose matter. Detecting and addressing mold growth early can significantly reduce the cost to remediate and repair damage caused by mold. However, left unaddressed, mold will eventually destroy everything it grows on. Mold can grow on any wet building materials, including stucco. Once it is discovered, it must be addressed quickly and properly. 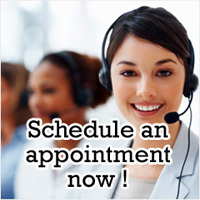 Delayed or improper treatment of mold issues can multiply repair costs exponentially. 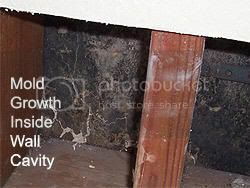 Eventually the moisture and mold can penetrate all the way through to the interior side of wall surfaces. By that time, extensive damage to the structure has already taken place. A visual inspection by a Certified Mold Inspector can help detect water intrusion issues early, saving thousands of dollars in repairs costs. A second story toilet malfunctioned while these homeowners were out of town on vacation. Within minutes the water saturated the second story bedrooms and several rooms below. Days passed before a neighbor noticed water running down the driveway. 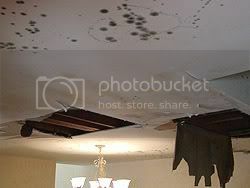 Almost every square foot of drywall in the home was damaged by water or mold or both. All carpeting and hardwood floors were destroyed as were the kitchen and bathroom cabinets. 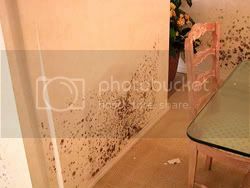 Even the furniture absorbed water and became contaminated with mold. 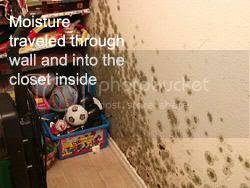 Because of the extremely high humidity levels inside the home, mold growth was found even in places that never came into direct contact with water, such as in the closets where linens and clothing were destroyed. If you owned this property you would be fully aware of the problem and the extent of the damage. But what if you were considering buying this home? What if the remediation was not properly done and there was still mold growth inside the walls? How would you know? 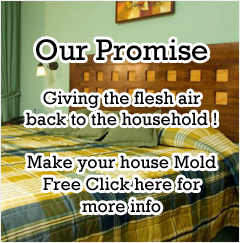 Hiring a PrimeAire Certified Mold Inspector is the answer. New carpet and fresh paint cannot mask active mold growth from a trained professional with sophisticated state-of-the-art testing equipment. Before you buy your next property, insist on an independent mold inspection. 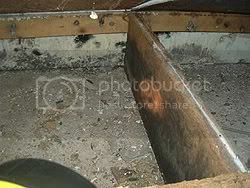 Not all water intrusion and mold problems are as obvious as the example above. Some of the most troublesome problems are not visible at all to the untrained eye. At first glance this cabinet showed no visible signs of mold or water damage; only a slight "musty" odor that most people would dismiss as a typical sink smell. 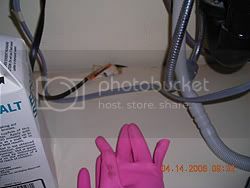 Using state-of-the-art testing equipment, PrimeAire certified mold professionals were able to confirm that mold was in fact originating from under the cabinet. 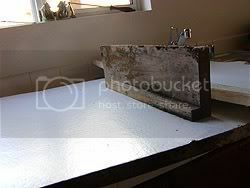 A leaky faucet was the source of moisture that lead to mold and water damage to the cabinet framework, the drywall behind the cabinet, the insulation inside the wall, and the framing lumber. The cost to repair a job like this is considerably less than the job shown above because a Certified Mold Inspector was able to detect the problem at an early stage. Had this problem gone unnoticed, the remediation cost would have been significantly higher. The key to limiting mold damage is being pro-active. If you suspect you have a mold problem, don't ignore it, address it immediately. 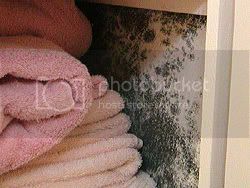 A common mistake people make is to assume that only visible mold is a problem. In vain, they attempt to wash moldy areas with bleach or cover mold up with new paint, wallpaper, carpet or tile – none of which solves the problem. Unless all mold contaminated materials are removed or properly remediated, mold will keep coming back. The only way to correct indoor mold problems is to eliminate the cause, remove all mold growth and control moisture.